“What Boeing Can Learn From Oncologists and Hackers” on C-Suite Network – Linda talks about the value of good user experience. “Two Successful Female Business Partnerships” on Life Lessons at 50 Plus – An interview with Linda Popky and Lisa Anderson who talk about being co-executive directors of the Society for the Advancement of Consulting (SAC). “The just-in-time effect: How Amazon and Uber have changed associations” on MULTI BRIEFS: EXCLUSIVE – Linda discusses how to survive in a just-in-time world. “Nominations Open for Advancing Consulting Award” – Linda Popky says this award will acknowledge the work done by sole practitioners. “Are you being served? What about your customers?” on MULTI BRIEFS: EXCLUSIVE – Linda discusses how to satisfy customers. “An Empire Crumbles: Why the Jussie Smollett Situation Matters for Business” on C-Suite Network – Linda discusses the business lessons that can be learned from this case. 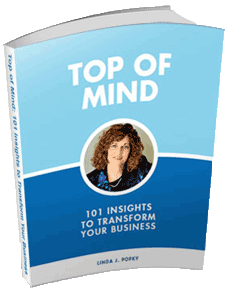 “Consulting Guru Alan Weiss Headlines May 29 Boston Area Workshop” – Linda Popky monitors a panel discussion on Published! A Look at Publishing Alternatives for Consultants. “Consulting Guru Alan Weiss Headlines San Francisco Area Workshop on March 27” – Linda Popky, Executive Director of SAC, recommends this event for consultants who want to have the opportunity to interact with Alan Weiss. “Will someone leave the light on for us?” on MULTI BRIEFS: EXCLUSIVE – Linda discusses business lessons from the PG&E bankruptcy. “Plagiarism or Sloppiness: What Happened to Jill Abramson’s Merchants of Truth?” on C-Suite Network – Linda discusses lessons that anyone who produces work to be published should follow. “Who blinked? Business lessons from the recent government shutdown” on MultiBriefs: Exclusive – Linda discusses what business people can learn from the government shutdown. “Here’s The Real Reason Service Guarantees Work*” on Forbes – Linda explains how a complaint is actually a gift from a customer. “Hiring Top Talent With Passion and Enthusiasm Key to Beating Talent/Skills Gap” – Linda observes that building a strong brand attracts strong talent. “Is This the Best a Brand Can Get?” on C-Suite Network – Linda discusses why it is good to do something different in marketing to stand out above the noise. “Who’s Winning? Lessons from The Government Shutdown Crisis” by Linda J. Popky on Commpro. Linda Popky discusses how the heat of friction drives innovation – when it’s managed appropriately in a win-win framework. “Cut Through the Noise: Traditional vs. Digital Marketing Part II” by Carie Ferg, Manta Contributor, Midlands Directory. 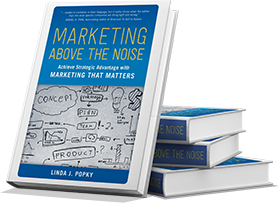 Linda Popky discusses whether to use traditional versus digital marketing based on your audience and prospects.